With great power comes great responsibilities and with greater innovations, there might come greater embarrassments. The Windows 98 launch was the greatest example of the above statements. 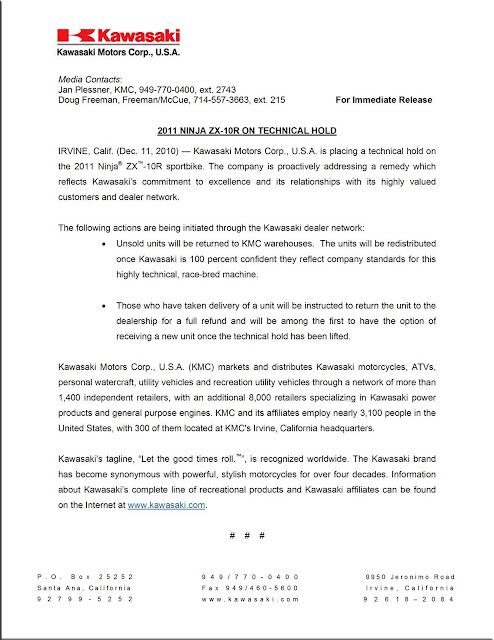 Well seems like Kawasaki Motors Corp U.S.A, is facing the same music with it's highly ambitious 2011 Kawasaki ZX-10R project. Some kind of engine issue has been identified (the details of which have not been revealed) and the unsold units of the bike have been put on hold from being sold and are being called back from dealerships, and the owners of the sold units are being requested to bring their machines back to the dealer for a full refund and are being promised to be catered on a priority basis as soon as the issue is rectified. 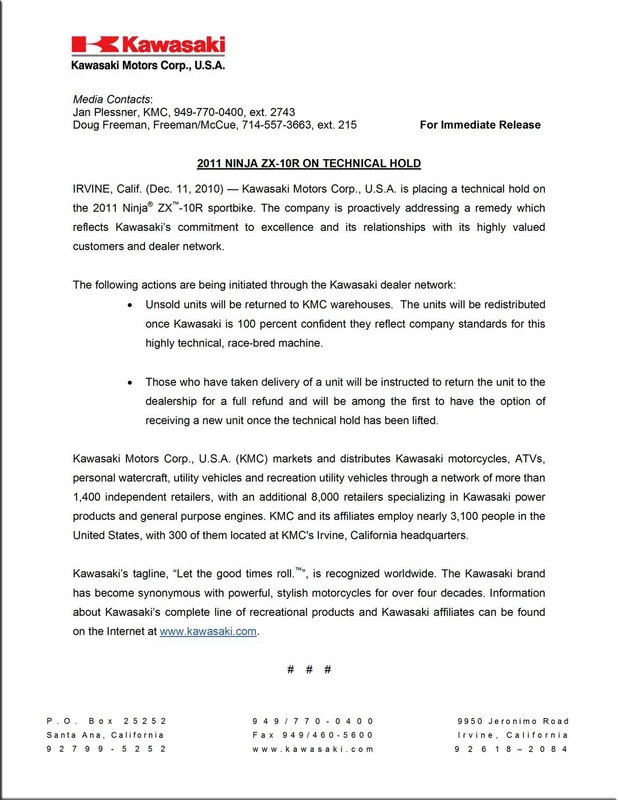 This hold off/call back might prove to be a serious blow to Kawasaki's aim to take on the mighty BMW S1000RR head on. Initial reviews of the 2011 Kawasaki ZX-10R, suggested that it, should be the bike to beat for the year 2011 and knowing that there's nothing changed in the engine for the year 2011 for Yamaha, Suzuki, Honda, Ducati for their liter class flagships and with the specs of the KTM RC8R not that challenging enough for the ZX-10R, the BMW S1000RR was the direct competition to battle with. The engine issue cropping up at such a crucial time, might render the head honchos, insomniacs. Well, let's see what lies ahead, because I for one started to like the 2011 Kawasaki ZX-10R, inspite of it's front looks and that hideous exhaust.